Len Metcalf discusses his approach to photography and teaching. Directed, filmed and produced by Ben Coope from Leap Films. Spend three days with Len Metcalf, learning his simple method for digital black and white photography. A lovely mix of classroom and location shoots. An ideal introduction to monochrome photography. Spend five days with Len Metcalf photographing the stunning coast around Kiama. Each day we will have two location shoots and two classroom sessions, where we will process, critique and print your work. We will look at photographic techniques to help you with your seascapes, both in the field and in the classroom. Learn iphone photography in this three hour workshop based in Sydney. We start from the basics and teach you how to use your iphone camera to take photographs. You will not only gain competence and confidence with your camera phone, but you will also learn the basics of good composition. Once you have mastered the art of using your iphone camera, you will be introduced to some fantastic camera apps to milk the most of your camera. Book Len for as little as two hours in at the Willoughby Studio in Sydney for private photographic tuition. A weekend with Len Metcalf in Katoomba, in the stunning Greater Blue Mountains World Heritage Area. Here you get individual attention and we can work on the skills you identify. Photography technique, post processing, and printing. Bring a friend and save. 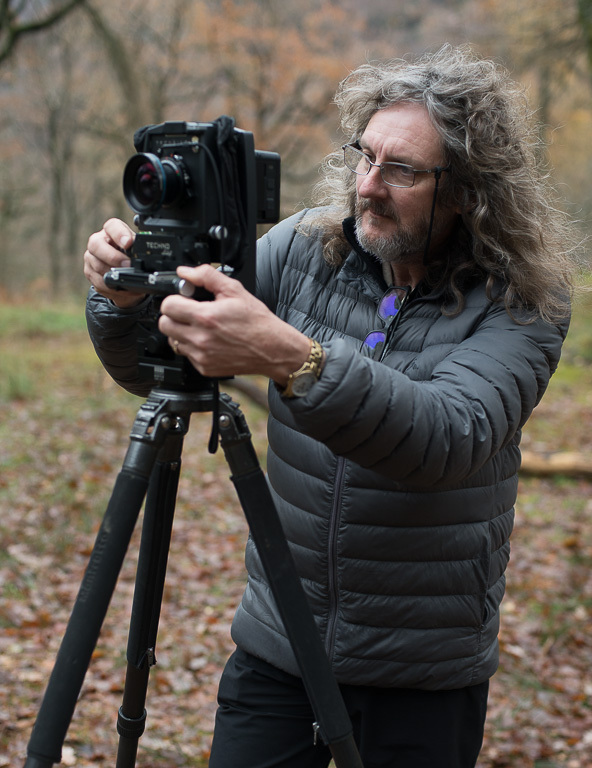 "I spent two full days recently with Len, learning to use a Fotoman 617 panoramic camera and an Ebony 4x5" view camera.I had never been to a photographic workshop or had any photographic tuition, and I really wasn't too sure what to expect. Len has been mentoring photographers for the past twenty years. Working on their photography aesthetic, photographs, technique, presentation and businesses. Len offers short two or three hour intensives and/or ongoing regular sessions. Regular clients understand the importance of having a critical and encouraging eye pour over their work giving feedback from the heart. A mentoring program to take you to that next level. Imagine being inspired and supported to work on your own photographic projects. Printing your work regularly and presenting it for valuable and informative supportive feedback. Eight sessions over a year, of 11 days, including 3 weekends, this is the program that will push you further. Unlike any other photography workshop, this program is unique. "To dearest Len, Thanks again for a wonderfully inspirational year in Focused Lens 2015! It's always such a fabulous learning opportunity for us all. " Focused Lens has been running successfully for the past six years. It operates in two versions, one on Wednesday Evenings, and the other on Sundays and three full weekends. It’s primary purpose is to keep you photographing regularly. By committing to a facilitated group, you make a commitment to bring new work to each session. At these sessions you will get individual feedback, creative ideas and encouragement. Imagine how quickly you will grow with a master photographer guiding you regularly. "Dear Len, Thank you for your time and wisdom this year. Your guidance has been invaluable. It is always a pleasure to be taught by you." What can I say? Having attended three other photography tours in Morocco, Kerala and Venice, Len provided by far the best. Passionate, patient and approachable. You not only feel you learn so much about your camera and photography, you come away from the experience having benefitted from contact with an outstanding human being. Sign up with your email address to receive weekly updates of Len's articles, photographs and Len's School workshop announcements. We recommend only signing up to one of these newsletters. Most photographers seem to prefer the daily inspirations. Sign up with your email address to receive Len Metcalf's daily inspiration with his photographs and writing. Len Metcalf’s photographs will be exhibited alongside the Iconic Australian work of Max Dupain, at Light and Shadow Gallery, Leura, between 1st December 2018 - 8th January 2019. Len's Studio is open for the Willougby Artists Open Studio Weekend. Len has just spent a month with his Olympus M.Zukio 25mm f 1.2 Pro Lens, and in this review he discusses his observations. He also shows direct comparison with the Olympus 25mm f1.8 lens and the Voitlander 25mm f 0.95 lens. Macphun Tonality is Len's favourite post processing software for black and white conversion. 16 Bit workflow, adaptive exposure, smart contrast, clarity, structure, mirco structure, and layers make a fantastic plug in to Lightroom. Much better than Silver Efx Pro. Support Len buy purchasing by clicking through from this link here.